First, a correction and an apology to my readers! In an earlier Post, I stated the the La Paz waterfall was no more. This mistake brought to my attention by a reader Mario and since verified. Although La Paz is still running muddy, it is still there, although the damage to the surrounding area is extensive. More and more aftershocks are hitting the same area and those still there are living in constant fear. Yesterday afternoon at least 10 aftershocks were felt areas of Sararipiqui. The smallest was 2.7 and and the largest was 4.5 (about 2 PM yesterday) on the Richter Scale. Many could be felt here in the Central Valley. The weather is not helping. While the Central Valley enjoys near perfect weather, the mountainous areas in and around Sararipiqui and the Poas volcano are suffering rain almost daily. The risk of mud slides is high and there is some talk that the government may have to evacuate the area. Because some areas can now only be reached by helicopter, and the rain and low cloud cover prohibit that, an evacuation would indeed be a daunting task. I have received several emails from people planning trips to Costa Rica, all asking if it is safe to travel here. The overall answer is yes. 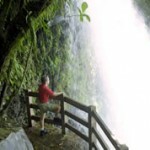 Clearly, however, if your travel plans included a day trip the the Poas volcano or you were planning to raft on Sararipiqui river, planning to stay at the Peace Lodge and visit the La Paz waterfall, you should certainly delete those from your itinerary. Check with your travel agent as to when these attractions will again be available. Currently, the death toll is at 23. As there is still a list of missing, this will probably rise as searchers now have given up the work.